The author of the movie Jaws, Peter Benchley based his follow-up novel The Deep, set in Bermuda, around the Constellation shipwreck. Much of Benchley’s knowledge about shipwrecks and the story-line that he created in this movie was from Teddy Tucker, the legendary treasure diver of Bermuda. We had the great opportunity to listen to Teddy and his wife about how this movie was created around his life of scuba diving and treasure collection. Teddy himself played a role in this movie. 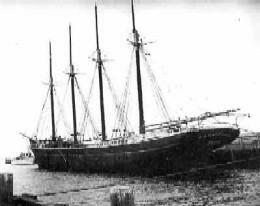 The Constellation was a wooden hulled vessel with four masts originally built in 1918 and measuring 192 feet in length. She was originally named Sally Persis Noyes and sailed as part of the Crowell and Thurlow fleet. She was later sold in 1932 to Mr. Robert L. Royall and renamed as The Constellation. Mr Royall's plan was to rebuild this fine sailing ship and make her into a floating marine school. Constellation was completely rebuilt and provided with all of the modern comforts, including electricity, refrigeration, plumbing, a modern galley and large staterooms. Unfortunately, Mr. Royall's plans did not work. It seemed that there was very little interest in this type of sailing, and within a year the ship was put up for sale again. The Constellation found her way to New York and after one or two short trips remained there until 1942. When World War II broke out, the demand for ships of any kind became enormous. The Constellation, now owned by Intercontinental S.S. Company, was converted back into a cargo vessel. In July 1943, she was en route from New York Venezuela, carrying a general cargo of building materials, medicinal drugs and 700 cases of Scotch whiskey. Not long after clearing New York, her steam pumping gear broke down, and she began to take in water with the weather getting increasingly rough. The crew used hand pumps for several days but could not keep up with the leaking vessel. 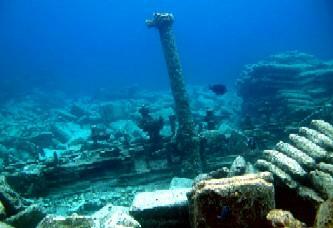 Captain Howard Neaves, who was 71 years of age, decided to head towards Bermuda for repairs. On July 30 1943, while waiting for a local pilot, she was driven by a strong current when her hull was broken apart by a reef. Today, the broken hull of this Bermuda's famous shipwreck lies on a coral sandy bottom in 30 feet of water, exposing cement bags (as you can see in the photo), cups, nail polish bottles and a vast assortment of small items. Some of the building materials remain, but the rest of her cargo is long gone. In the cracks and holes formed by the bags, many juvenile Coney's, speckled Eels and octopus live. The ever-present Bermuda Chubs flock in hundreds here too. Algae's grow very well on the cement bags, attracting large populations of Parrot Fish. You can see predator fish looking for easy pickings, there are usually numerous Trumpet fish hunting the Juveniles. You also see vast school of Barracuda and Groupers. 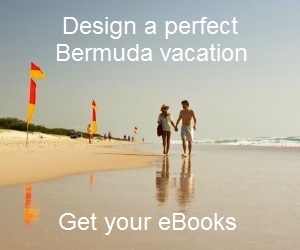 As this is one of the most popular sites in Bermuda, the fishes are used to divers and do not hesitate to come very close.